Seventy years of Porsche sports cars. Seventy years full of emotion. Porsche Design pays tribute to this important anniversary by introducing the 1919 Datetimer 70Y Sports Car Limited Edition, a special edition limited to 1948 time-pieces. Looking back to 1948, when the Porsche 356 – the predecessor of the Porsche 911 – debuted, the timepiece combines design elements and special characteristics of the vintage car’s dashboard and reinterprets them for the wrist. The 42 mm titanium case is water-resistant to 10 bar. Housing a high-quality, automatic Swiss movement with a 38-hour power reserve, it is equipped with the brand’s characteristic Porsche Design Icon Rotor. The titanium carbide coating yields a subtle, matte-black shine. Adding an elegant touch to the sporty look, it maintains focus on the essentials of the watch: the black dial. 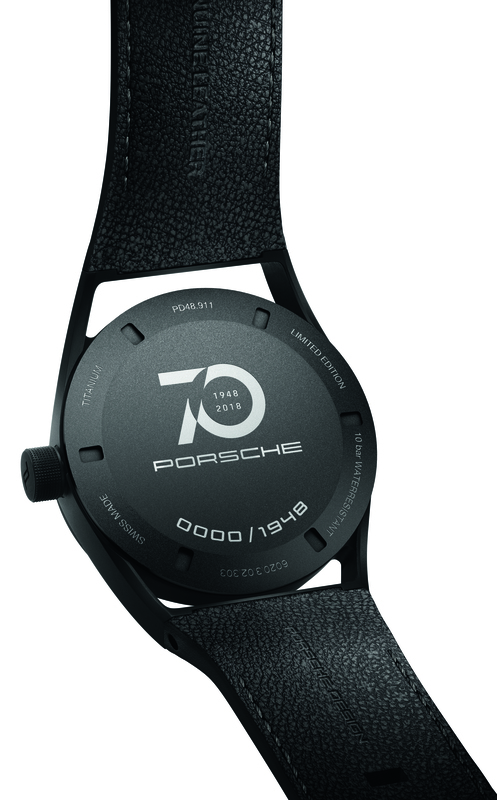 The caseback is finished with a special “70 years” logo engraving, as yet another tribute to the Porsche anniversary. Decorated with the silhouette of the Porsche 356 and the year 1948, the watch commands attention with its clear and functional design. The dial includes the characteristic tachometer rings used in the dashboard of the legendary Porsche 356. In order to guarantee maximum contrast and readability, the hands are executed in white, and the three-dimensional ceramic numbers and indices are precisely inserted into the dial’s perfectly shaped, milled recesses. Even at night, they offer extreme brightness. The date window at “3 o’clock” ensures an easy-to-read display, without visually disturbing the dial’s minimal design. And just like the seats of Porsche sports cars, the bracelet of the anniversary watch is made of the highest quality leather. The 1919 Datetimer 70Y Sports Car Limited Edition complements the exclusive 1919 Collection, which is inspired by the puristic clarity and functional aesthetics of the Porsche 911. The collection, which raises the bar for high-quality timepieces, is currently available in 13 versions. The limited edition timepiece delivers in a custom box with a special limitation badge. 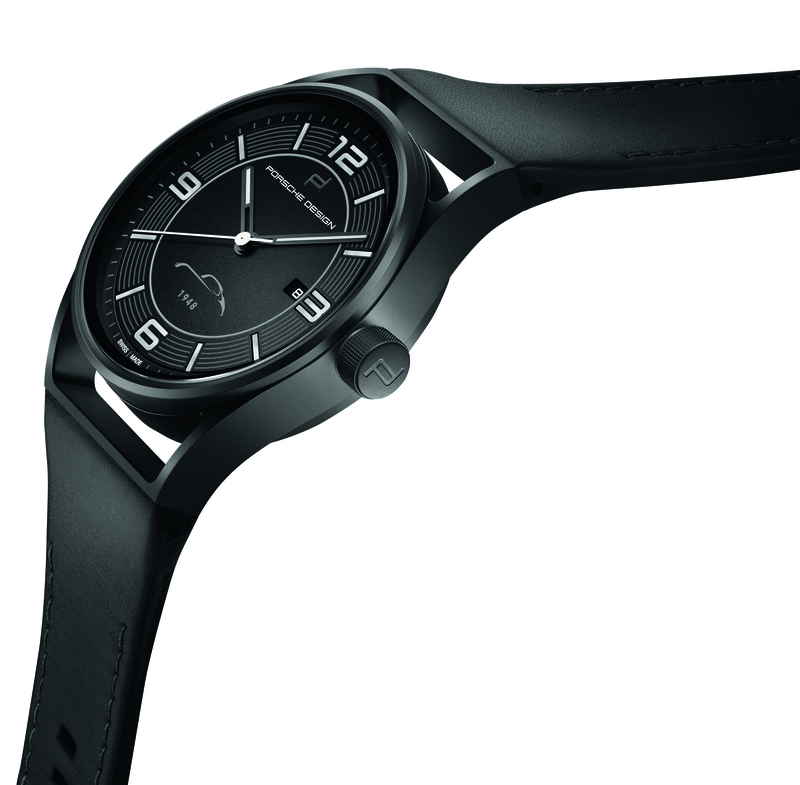 The watch is available as of June 2018 and retails for EUR 2,948 (RRP) at Porsche Design Stores, Porsche Centres, specialty retailers, and online at www.porsche-design.com. In 1963, Professor Ferdinand Alexander Porsche created one of the most iconic design objects in contemporary history: the Porsche 911. Following his vision to take the principles and myth of Porsche beyond the automotive world, he created the exclusive lifestyle brand Porsche Design in 1972. His philosophy and design language can still be seen in all Porsche Design products today. Every Porsche Design product stands for extraordinary precision and perfection, boasts a high level of technological innovation and seamlessly combines intelligent functionality and puristic design. Created by Studio F. A. Porsche in Austria, our products are sold worldwide in over 130 Porsche Design stores, high-end department stores, exclusive specialist retailers and the official online store (www.porsche-design.com).